Many guests stay at our Gold Canyon hotel to explore Superstition Mountain or to partake in the Lost Dutchman Marathon. Whether you're here to tap into your inner warrior at the Renaissance Festival or to check out the Dolly Steamboats, our Gold Canyon hotel caters to you. We have a friendly staff, a great location, and the best amenities in town. Spacious, well-appointed rooms make it simple to relax after a day of adventure. Luxury bedding and beautiful decor make you feel right at home. With a Western theme and corporate mining near the property, guests at our Gold Canyon hotel can really get into the Wild West spirit. We offer quiet surroundings, perfect for a rejuvenating getaway, and there are also golf courses nearby for spending an afternoon on the links. Leisure is a top priority here, but the locals also know how to have a good time, especially at the annual Country Thunder USA. The Lost Dutchman Days is a popular event, but at our Gold Canyon hotel it's easy to relax after a day of excitement, away from the hustle and bustle of the city. Theres easy access to the highway, which makes it simple to zip around to the top destinations. If you're staying with us for business, you'll especially enjoy our convenient meeting facilities. A few of our regular guests are in town for work with mining companies and Canyon Lake Marina and Campground. Whether youre here for a special event, on a vacation, or traveling for work, our Gold Canyon hotel staff is committed to making your stay peaceful and enjoyable. Our rooms are spacious and perfect for extended stays or long weekends. You deserve to be treated to only the best in service and quality while traveling, and that's what our Gold Canyon hotel delivers. Rest assured that you'll have a great experience staying with us and will be only a short drive from the most popular attractions. Reserve a quiet stay at Best Western Gold Canyon Inn & Suites today for a great value. Enjoy your stay. From: U.S. 60. 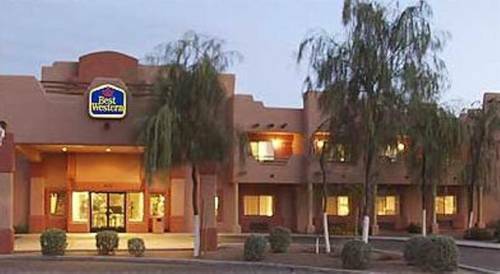 The Best Western Gold Canyon Inn & Suites is located 7 miles east of Apache Junction, on the northeast corner of Kings Ranch Road and U.S. 60 (Gold Canyon). Exit at Kings Ranch Road. The Best Western Gold Canyon Inn & Suites is on the right side. From: Sky Harbor Airport. Take 202 East to 101 South to 60 East. Exit at Kings Ranch Road. The Best Western Gold Canyon Inn & Suites is on the northeast corner. Rodeo Lounge, on premises, limited menu available including fresh made pizza - happy hour with drink specials 3:00 p.m. to 6:00 p.m. Western style lounge. ~29 miles from Gold Canyon. ~36 miles from Gold Canyon. ~39 miles from Gold Canyon.